B.R. 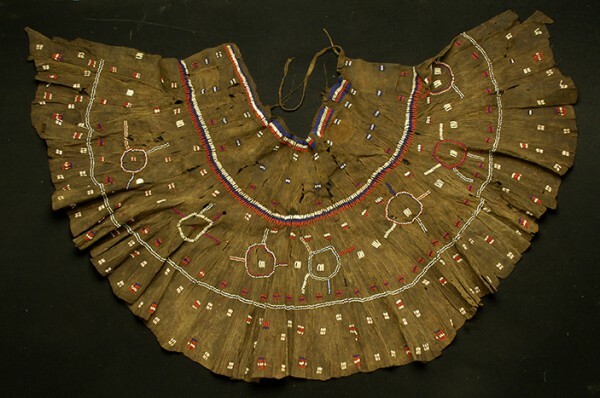 : Its a skirt worn by a Young girl worn during her coming of age or rebirth ceremony. I do not know the local Iraqwi expression for this ceremony but the whole point is that the Young girl, normally 12-14 years of age is put into seclusion for a period of to one year. During this time, when she is in Total seclusion from the village, normally in a hut of her own, she is fed a special diet of rich cows fat and milk via elder women belonging to this secret women’s society called ‘Marmo’. During this time of seclusion she is taught the rituals of this society. This ritual and the society was outlawed in the 1930’s by the colonial administration. At the time because they were afraid of such societies existing and working against their law and control. BvH: Could you tell something about the pattern- decoration of the skirt? Are there any rules or is each one unique? BR: The girl is taught during this time how to make this beaded skirt. The design is completely her creation and so each skirt is very individual. 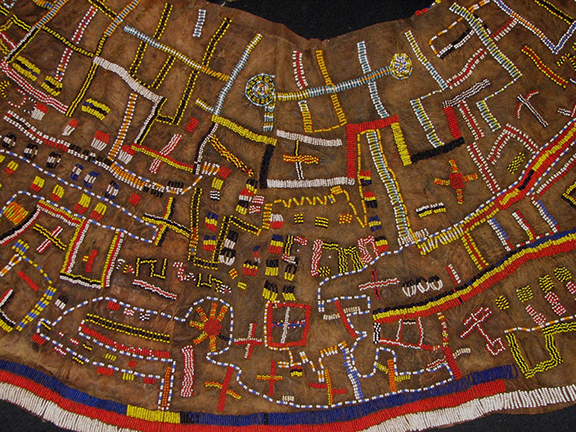 There are some design or pattern elements that carry through from skirt to skirt ,one is a up down and along line of beads that represent the River that runs through the tribal heartland. Some other elements are the sun and stars. The use of white beads is important as it represents purity and rebirth. It is though that the patterns are a visual interpretation of the Iraqwi landscape, with tracks, rivers, and fields being represented by lines of beads, etc, etc. 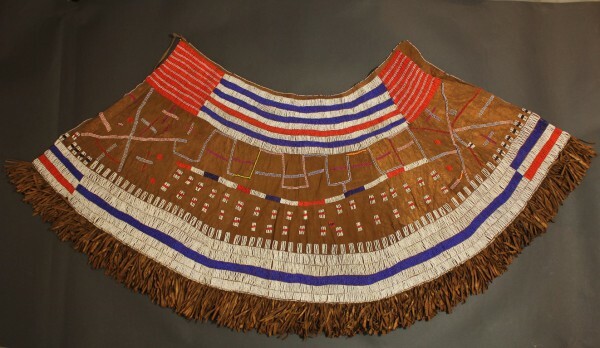 The skirts are then passed down from mother or grandmother to daughter and so on They are very rare and extremely difficult to find and purchase if available. Most of the skirts in my collection purchased by trading of cows and or goats and only if they were willing to part with the skirt. It is not known if this women’s society is still in existence and if or the secrets of this society have been kept and passed down to today-s generation. BvH What material is used? B.R. : They are made of strips of goatskin sewn together. I saw one skirt at the Tribal Art fair Amsterdam, and had a conversation with Brian Reeves. He later replied my further questions by mail and sent some more pictures of skirts in his collection.